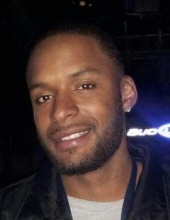 Buford, Royce Lee, 28, of Louisville died Tuesday October 23, 2018 at Sts. Mary & Elizabeth Hospital. He was a food service worker for several restaurants and a Baptist by faith. His funeral service will be held 1:00 PM Monday October 29, 2018 at W. P. Porter Mortuary 2611 Virginia Avenue, with burial in Green Meadows Cemetery. Visitation will be held 11:00 AM to 1:00 PM Monday. To send flowers or a remembrance gift to the family of Royce Lee Buford, please visit our Tribute Store. "Email Address" would like to share the life celebration of Royce Lee Buford. Click on the "link" to go to share a favorite memory or leave a condolence message for the family.